Comment: The head of the president of the Russian federation, Vladimir Putin, is put onto the body of the famous comic character „Popeye“. The figure is showing off his musculary arms, while popping out of an original copy of the Soviet propaganda newspaper „Pravda“ (Truth) from 1948. 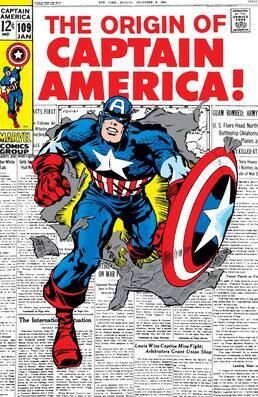 The setup of „Captain Russia“ was inspired by a famous comic book cover of the well-known superhero „Captain America“ from 1969 (Link). In someway the work can be seen as a huge cover for a comic book staring the bizzare hero „Captian Russia“ a mixture of Putin and Popeye. The stony-faced superhero shows us exactly where his superpowers are located: his pumped-up underarms. His tattoos show the nature of his powers: hammer and sickle on his right arm and the cross of the russian-orthodox church on his left arm. Vladimir Putin has a broad support in the Russian society – something which might surprise a person from a western country who is used to see him as the cold-hearted dictator supressing the Russian people. One of the reasons for his popularity is his domestic policy which combines two contrast: On the one hand Putin loves to flirt with Soviet nostalgia. For example by changing the national anthem back to the soviet version or reintroducing special soviet holidays. Today a lot of people in Russia love to remember the Soviet era as a time of stability and pride – especially after the rough years of the 1990ies. On the other hand Putin is the first president since the Zars who officially confesses to the Russian Orthodox Church which was forbidden during the soviet era. The church in Russia is gaining more and more popularity – and helps Putin to remain as popular as he is.